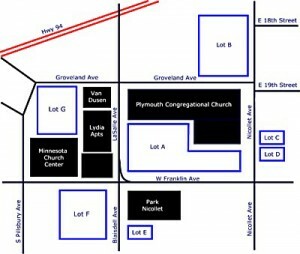 Plymouth Church is located on the southern edge of downtown Minneapolis at Nicollet and Franklin Avenues. Plymouth Church can be reached via Metro Transit buses Nos. 2, 17 and 18. Please note: To park in our handicapped-designated spaces, you must display a current handicapped hangtag or other official notice. Thank you! From the South or North via 35W – As you approach downtown Minneapolis, take I-94 West to the Lyndale-Hennepin exit. Stay in the right lane. Turn right on Dell Place very shortly after leaving freeway. Turn right on Groveland to LaSalle. Right on LaSalle for one-half block. Turn left into the church parking lot. From the West via I-394 – Go east on I-394. Follow the Downtown exits and exit at 12th Street. Stay on 12th to LaSalle; turn right. Go south on LaSalle, cross Groveland. Go a half-block and enter the church parking lot on the left. From the East (St. Paul) – I-94 West to the Lyndale-Hennepin exit. Stay in the right lane. Turn right on Dell Place very shortly after leaving freeway. Turn right on Groveland to LaSalle. Right on LaSalle for one-half block. Turn left into the church parking lot. From the North via I-94 – Take the Hennepin-Lyndale Avenue exit. Continue on Hennepin or Lyndale Avenues to Franklin Avenue. Turn left at Franklin. Continue on Franklin until you cross Blaisdell Avenue on your right (LaSalle on your left). Plymouth is on your left occupying the entire city block. Enter the parking lot from Franklin Avenue (left turn). Please note that vehicles in Lots 1, 2, 3 and 4 without a proper Plymouth permit are towed at midnight every night. No church parking in the Moonlight Cafe parking spots on Sunday mornings.